Although it just went live a little while ago, the Facebook page for the proposed march already has over 76,000 likes, and there appears to be a great deal of momentum, with local march committees already being established around the country. I suspect it would have happened anyway, as Trump’s blatant disregard for facts can’t sit well with the scientific community, but it certainly didn’t help that, since Monday, his administration has begun freezing research funding and blocking scientists from disclosing their discoveries, especially as they relate to climate change and the environment. I hate, of course, the fact that this is happening, but I absolutely love seeing people beginning to rise up in large numbers to confront what’s happening. I don’t think I’ve ever felt more patriotic than yesterday, when National Park employees across the nation began rising up online in response to the threat of a federal gag order, and it’s just building today, as stories are beginning to spread across the internet of scientists organizing and pushing back. Yes, this should have happened years ago in response to the anti-science policies and talking points of the Republican party, but I’m happy to see that it’s happening at all. And I imagine it’s not just women, park rangers and scientists that will join the fight. As more policies are enacted by the Trump administration, and more people realize just how much their lives will be impacted, more will join the resistance. No, this is just the beginning. As for what went on within the National Park Service yesterday, here’s a clip from the New York Times. 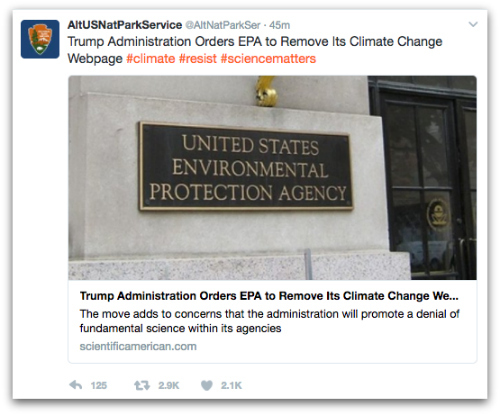 The Trump administration has ordered a freeze on federal grant spending at several government agencies, from the Environmental Protection Agency to the Department of Health and Human Services, followed by memos telling employees not to send out news releases or to create social media posts, blog entries or official website content, and to consult with senior officials before speaking to the news media. Such memos landed this week at the E.P.A., Health and Human Services, the Department of the Interior and Department of Agriculture in a broad halt to external communications while the Trump administration struggles to put political appointees into position. Small flare-ups of communications — apparently in dissent — appeared on Twitter, but they were quickly stopped. And it’s only gotten better since then, as National Park employees, after having been shot down by the Interior Department, went rogue and started their own private account, @AltNatParkSer, which is now being followed by 1.2 million people. Here are some examples. 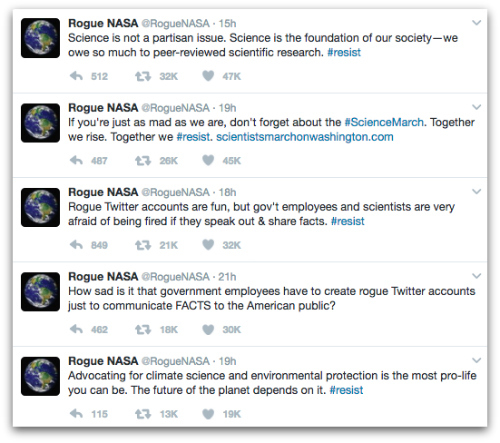 And, now, there’s also a rogue NASA account, @roguenasa. This, my friends, is what the beginning of a revolution looks like in the 21st century. This entry was posted in Civil Liberties, Environment, Politics, Science, Uncategorized and tagged @roguenasa, anti-science, Badlands National Park, border wall, cunts, Environmental Protection Agency, EPA, fake news, Free Speech, global climate change, Global Warming, House Committee on Science Space and Technology, Lamar Smith, lies, marches, NASA, National Park Service, peer review, protest signs, Republican lies, research, resistance, Science, scientists, scientists are witches, Scientists' March on Washington, social media, Theodore Roosevelt Inaugural Site, truth, Women's March on Washington. Bookmark the permalink. Post a comment or leave a trackback: Trackback URL. 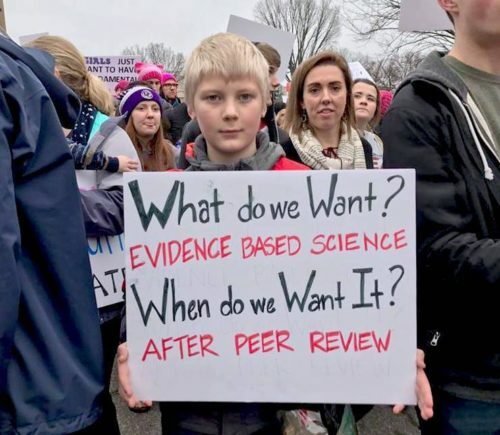 The March for Science has a Twitter handle too. Thank you all so much for all of your interest in a March for Science! If you’d like to help out, please fill out the form at https://goo.gl/forms/zAdY02dBEz3Ykii42 and visit our public FB page at http://www.facebook.com/marchforscience/. Organizers are currently working on our mission and will be meeting this weekend to work on the details of a DC march. We will announce a date soon, and are planning sister marches throughout the country – stay tuned! In less than a day, we’ve surpassed 200k members and are growing fast. As such, we’ve restricted posts and are thinning out old posts to help streamline conversations. Also, we are removing off-topic or discriminatory comments – please help us by reporting. Thank you all for your support and cooperation. I wish our scientists would have spoken out en masse years ago, when the Republicans were lying about climate change. They should have shut DC down then, but I guess they felt as though they had too much to lose. 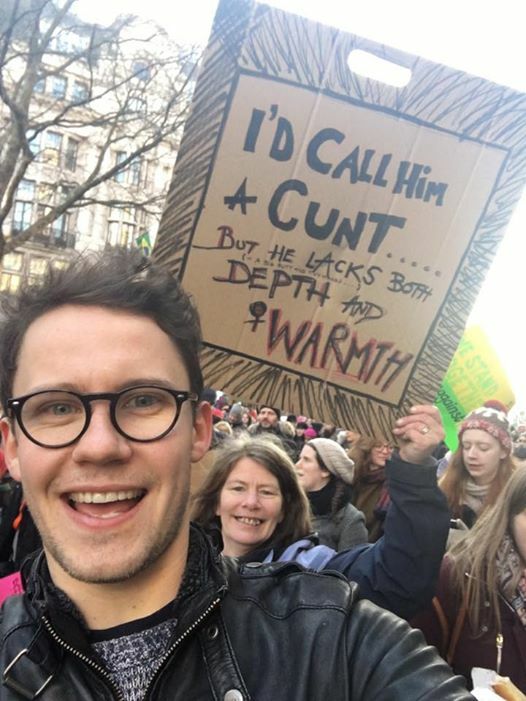 Trump has apparently crossed a line, though. Telling the EPA and other departments to freeze all grant programs is an enormous thing, and everyone who works in science and academia knows it. Thomas Dolby, where are you! Totally and completely necessary. This will be another big one. …But what will the hats looks like? And what liberal in-fighting will ensue afterwards? Well, they’ve come for the scientists. And it’s time to speak out, in the hugest possible way. And to give money. And to show up at your senators’ and reps’ offices and town hall meetings. And to big demonstrations. And to refuse to stay silent. Authoritarianism is upon us. Responsible Republicans, where the hell are you – or are you all gone? Mother fucker…. Alex Jones says the White House offered Info Wars press credentials. The European Investment Bank has pledged to maintain its target of investing around $20bn (£16bn) a year to fight climate change over the next five years. “We, Europeans, must lead the free world against climate sceptics,” EID president Werner Hoyer said. He also said Europe must become a leader in funding the next generation of sustainable technologies. His comments have been seen as a message to US President Donald Trump, who has pledged to scrap the country’s strategy to tackle climate change. He has also suggested he will pull the US out of the Paris Agreement on climate change. 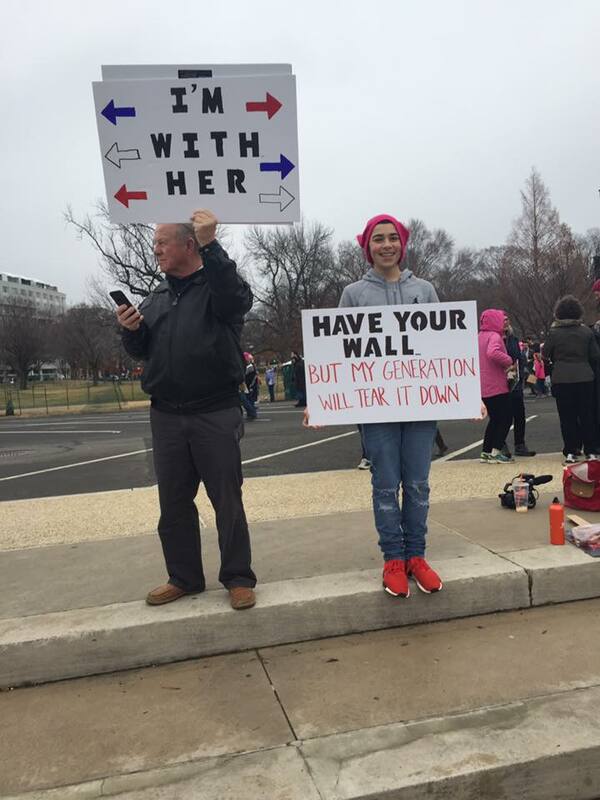 All of these marches are going to be great for DC’s economy. But, wait, it gets better. Scientists are running for office. Another anonymous email. This one claims to be from a mid-level Trump staffer. 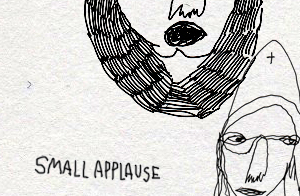 To answer your question, they’ll be wearing knitted, pink brain hats.